Photo shows suspects who trashed elementary school, ate teacher's ice cream | Crime Stoppers of the Lowcountry: 554-1111 | 1-888-CRIME-SC | Anonymous tips earn cash rewards with Crime Stoppers of the Lowcountry. ORANGEBURG COUNTY, SC (WCSC) - The Orangeburg County Sheriff's Office is asking for the public's help identifying three males who broke into the Edisto Elementary School and went on a vandalism tear early July 24. Ravenell said the trio emoved the fire extinguisher from a hallway and sprayed that section of the hall. The trio also helped themselves to some ice cream in the teacher’s lounge. A window in a classroom was also smashed. A photo shows two suspects covering their face via a jacket and a black t-shirt. Ravenell explains “We are releasing video surveillance footage of the three men who were in Edisto Elementary School in the early morning hours of July 24. The trio removed the fire extinguisher from a hallway and sprayed that section of the hall. The trio also helped themselves to some ice cream in the teacher’s lounge. A window in a classroom was also smashed. "We are confident that someone will recognize these young men and contact the sheriff’s office or Crime Stoppers to turn them in," Ravenell said. 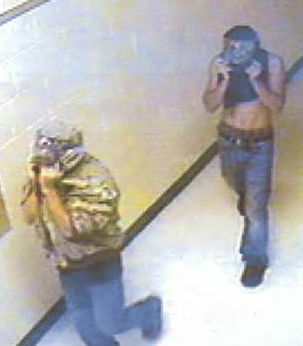 If you have any information on the suspects, call the sheriff's office at (803) 531-4647.